Such a time as this – Esther 4:14 | Systematic matters in Practical language for modern times. Systematic matters in Practical language for modern times. Saturday, opening weekend, I went and saw the movie Unplanned, in a theater that was surprisingly full, and perhaps not so surprisingly, made up of a mixture of mostly senior citizens and teenage girls. Much has been said about the movie; particularly its R rating. What follows, are my own thoughts. I found the movie, and the book which I finished reading at midnight on Friday, to be particularly well done, and also particularly personal. And in many ways, I felt I could relate to Abby Johnson, even though as I have been alerted to many times in an internet discussion concerning the movie, my anatomical make up does not allow me to carry a child, or to actually be faced with the decision of having an abortion. Abby Johnson’s story starts as a college junior at a career fair, where she meets a Planned Parenthood representative, who convinces her to volunteer at Planned Parenthood. The story continues over the course of several years, with Abby following along with the Planned Parenthood mantra that abortion is necessary, and that their goal is safe, legal, and rare. Abby believes all of this, and by her own admission, is rather naïve and gullible. And that is where I come in, and perhaps most people as well. The media, the government, Planned Parenthood, and countless others prey on that misinformation. Growing up, right until I was in Seminary, I was indifferent at best on abortion, because I was blind to what was going on. I believed the arguments of how bringing unwanted children into homes of unprepared parents was wrong. I believed that sick children should be aborted, because their lives would be miserable anyway. I believed that abortion was safe; that it was being done in only extreme cases; and that after all, it was legal, and if it was legal, it must be ok.
Like Abby Johnson, I was naïve. I was left out in the open, where I would one day be cast down and shown the truth of what abortion truly is: murder. For me, it was in a Seminary classroom, watching a video, hearing from women who had undergone abortions, and the gruesome way in which it was carried out; the babies butchered like animals, and then sucked out with a vacuum. A friend recounted later how he had to assist a vet with such a procedure on a calf stuck in a cow, and how even that was dreadful for all involved; how much more so on a child? You can say Abby Johnson should have known better working for Planned Parenthood; and maybe she should have. I was a Seminary student preparing to join the Ministry of a church body that was unapologetically pro-life, and I should have known better. One day, a whole lot of people will admit that they should have known better too. Unplanned shows the lie that the safe, legal, and rare argument truly is. It is definitely not safe for the child, and this movie proves that the mothers are not safe either. It is hardly rare; Johnson recounts how the clinic she oversaw did 40 surgical abortions on a typical Saturday, and gave out who knows how many pills for a chemical abortion. That is common, not rare. And while it may be legal, the question should be asked, why? Gosnell: The Trial of America’s Biggest Serial Killer showed essentially what a back-ally abortion clinic would look like; a dump, filled with cats, and garbage. Ironically, during the trial the ‘good abortion doctor’ was put on the stand to show the contrast to Gosnell’s clinic. The clinic in Unplanned is spotless; and yet the result is exactly the same: children are murdered, and women are left scarred physically and emotionally. There is one other thing that Unplanned shows; and it again relates to my own time at Seminary. Every Saturday, a group would meet early in the morning, about 100 yards from my dorm room, and go the nearby Planned Parenthood clinic and pray for an hour. I never went; I wish I had. Unplanned shows that prayer works, maybe not always immediately in the case of the mothers going inside, but in the case of Abby Johnson, and countless others who work in these slaughterhouses, prayer works in opening their eyes to what is going on. May we all join in prayer, that one day the eyes of all America, will be opened to the horror that abortion truly is. One of the latest trends in the world is minimalism. 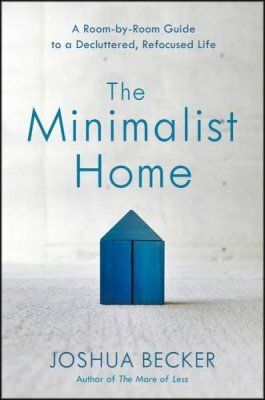 Curious about what this was, I picked up a new book on minimalism called The Minimalist Home by Joshua Becker, to see what it was all about, and because like most people, it would not hurt if I got rid of a few things. To start with, the minimalism I knew was what so often appeared on my Facebook feed, where you throw everything out and only keep the things you absolutely need. One principle is that if there are only 2 people living in the house, all you need are 2 plates, 2 forks and 2 knives, and likewise only 2 chairs. You keep the absolute minimum of what you need, and no more. That is certainly one way to go about it; but when we think about minimalism and when we think about hoarding, we always go to the extremes. The minimalist home is completely empty; and the home of the hoarder is filled with stuff. Minimalism, just like hoarding, can be sinful. Anything can be made into an idol, and just as keeping everything you’ve ever come into contact with is sinful, so too is throwing everything out and only keeping the bare essentials. To only have enough for what is in front of you, removes any and all efforts of helping your neighbor who is in need, or of gathering together as Christians in a spirit of fellowship for the building up of the body of Christ. If all you have is the absolute bare minimum, you are removing yourself from any and all opportunities to participate in the body of Christ. We should also recognize that material goods are First Article gifts given to us by God the Father for life in this world. Now you may not need 12 of everything, but there is nothing that forbids you from owning possessions either; just so long as they do not become idols that distract you from the true Word of God. It has long amazed me as I have sat in some homes, that years ago, there were upwards of 6 people living in a house that now only holds 2 people. As Americans, we have filled our homes with stuff; and that stuff has consequences of what else can go into a home. Televisions, computers, even bookcases all take up space, and if something fills a void, that means that space cannot be filled with something else. So what have I learned about minimalism? Well, Becker is actually an Evangelical Christian, and while he never mentions the First Article, the evidence is clear. He says you can own stuff, you can keep all the stuff you want, but ask yourself why are you keeping it? In one chapter on the living room, he says that your home should reflect, even confess who you are to others who come to see you. What will people say when they enter your house? Is your faith reflected in your home? Another chapter on the dining room emphasizes how eating together is where family bonds are built and strengthened; and how this happens so much easier at a table that is not covered with ten other things that distract or prohibit the family from eating together. The office likewise allows for more work to be done when it is not cluttered with so many other things. I’ve kept some stuff for years, and yet I’ve never looked at it other than to decide I need to keep it in a box a little longer. All well and good; but one day I need to admit that I should get rid of it; and that it is taking up space that could be used by something else. Minimalism is interesting; and somedays it is tempting to just throw everything out. But what remains must be in confession of who and what you are today, no matter how many First Article gifts you can fit into your home. Quiz time! What was the focus of last year’s midweek Lenten services? Give up? It was the account of Joseph found in Genesis 36-50. It’s ok if you forgot; a lot can happen in a year; there were lots of other sermons and services at the church, not to mention all the things that happened in your own day to day lives that occurred in between. In fact, while you probably remember the general idea of the Joseph account in Genesis 36-50, you may not remember every little detail that we examined in the services and in a series of midweek videos that were posted online. Again, it’s all good. I myself have very few recollections of any Advent or Lenten series that I have heard preached by others over the years; and sometimes struggle to remember the details of the series I have actually preached. Now take your struggle to remember a Lenten series that was a year ago, and consider how much of it you would remember if it had been 400 years ago! Because that is how much time passes between the end of Genesis 50 and the beginning of Exodus 1. 400 years come and go in the turn of a single page, and in that 400 years, a couple of things happen: first, the family of Jacob, that numbered 70 when they went down into Egypt, now is a great nation, mighty and strong. Second, leaders arose in Egypt who did not remember or feel indebted to Joseph for all that he had done to save Egypt, and then make Egypt a world power during the famine. And finally, the people of Israel, who have now been in Egypt longer than they have ever lived anywhere else, see that it is time to leave. Exodus begins with this conflict: the children of Israel are no longer welcome guests in the land of Egypt, and there is a desire to suppress them by Pharaoh, which results in a desire to leave on the part of the children of Israel. What follows is the call of Moses, and then the 10 plagues, the Passover, and then leaving Egypt while crossing the Red Sea waters on dry ground. But while that is the part of Exodus we easily remember, and that is the part that always makes it into movies about the Exodus, there is so much more to the Book of Exodus then just this conflict and its ultimate resolution, it also is about the children of Israel learning to be the people of God. The wilderness wanderings, highlighted by an extended period of time at Mount Sinai, is confirmation instruction for the whole nation. This is what it means to be God’s people; this is how you are to worship Him; this is how you are to treat one another; and most importantly, this is how you will be different from all the other nations. This Lent, we are going to pick up right where we left off last Lent. We are continuing the story just as the Scriptures do. Our midweek services will focus on the Book of Exodus, starting with the conflict in Egypt, but then continuing on to Mount Sinai and seeing how God takes this group of people and molds them into His people. And we will see how the Exodus, the central event of the Old Testament, points us Christ, whose death and resurrection are the central event of world history. Join us on Wednesday’s at 7PM at First Lutheran, Plainville as we make our way through the Book of Exodus. In preparation, you may wish to read the Book of Exodus, a few chapters each day, to get the full account. Also, during this time of Lent, please make use of the daily devotions from Lutheran Hour Ministries; also consider praying The Litany (LSB p. 288 or TLH #661) each day as part of your devotions.